How difficult is to book Tatkal ticket via IRCTC website? Do I need to ask this question? At Techglimpse, we had written plenty of articles to help our readers book tickets in IRCTC. Here’s another to that list. 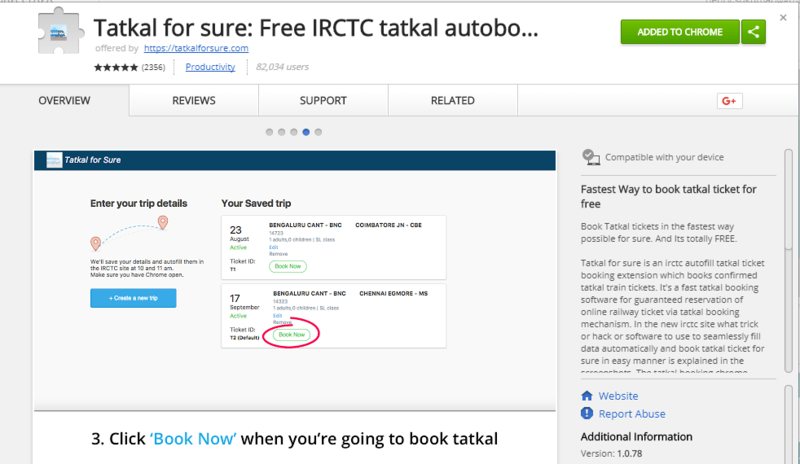 I recently came across an interesting application called “Tatkal for Sure” – a browser extension and Android app that aims to improve the chances of booking Tatkal tickets in IRCTC. Really? Yes, it eases the ticket booking process by automatically filling the details. Book tatkal tickets fast in just 30 seconds. Tatkal for Sure is available as an extension for Chrome browser and Android application. Step 1: Download extension and install it. (For some reason, the extension has been removed from Chrome webstore). I’ll update this article once the extension is back to the webstore. Thanks Mohad Asif for letting us know in the comment section. Update on 17th July 2018: The Extension is back in the chrome webstore. However it doesn’t seems to work properly. Please check for yourself for their website. Step 2: Once installed, click on the extension icon located on the browser toolbar. 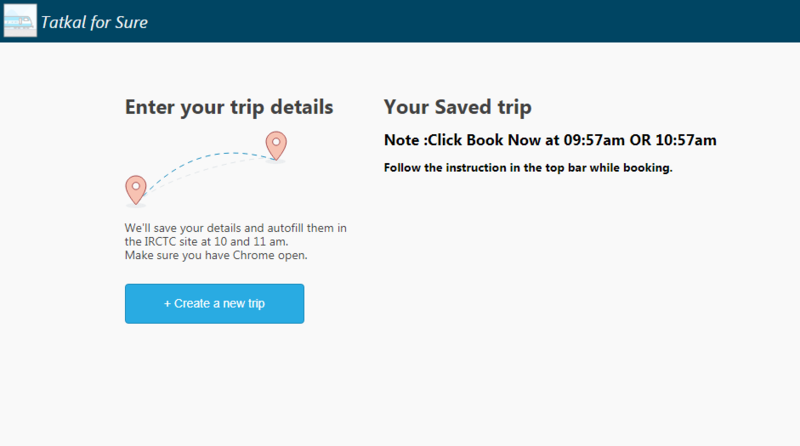 Step 3: To enter your trip details, click “+ Create a new trip” button. You need to do this before tatkal booking time. The extension suggests to fill these information before 9:57 AM (for AC classes) or 10:57 AM (non-AC classes). Step 4: Fill in your details. Enter IRCTC username and password. Enter passenger details and payment information. Enter your mobile no. and special conditions as shown in the below image. Step 5: Enter your payment details. According to the extension, the payment information is not stored by Tatkal for Sure. However you must be aware that the information is entered in the pages of an extension. Step 6: Done entering the details? Your trip will be saved. Step 7: Just before tatkal opening (say around 9:57 AM for AC classes and 10:57 AM for non-ac classes), click on “Book Now” button located within “Your Saved trip“. What if you are late for tatkal booking? The saved trip in the extension page will show as expired. 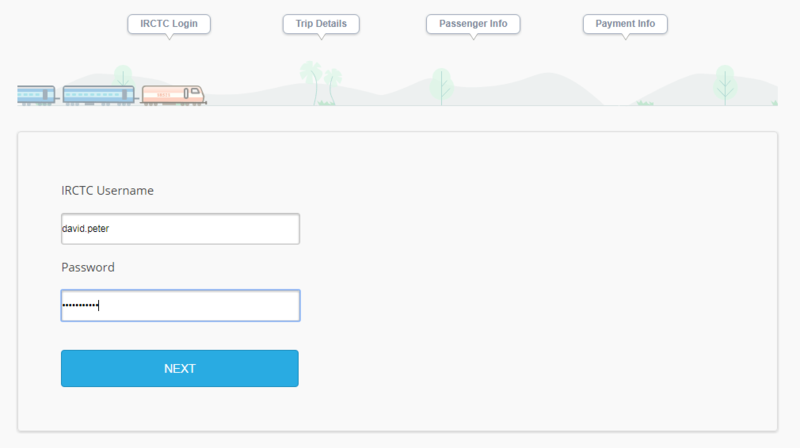 Step 8: If you are on-time for tatkal booking, then clicking “Book Now” button will take you to IRCTC login page – where you can see the username & password fields filled automatically by the extension. How about captcha? Ahh, you got me stuck there. The user still needs to enter the captcha. Step 9: Upon successful login, the extension will take care of auto-filling travel details and takes you to the payment page. In case, if you had not saved payment information in the extension, then you need to manually input those details and complete the payment. 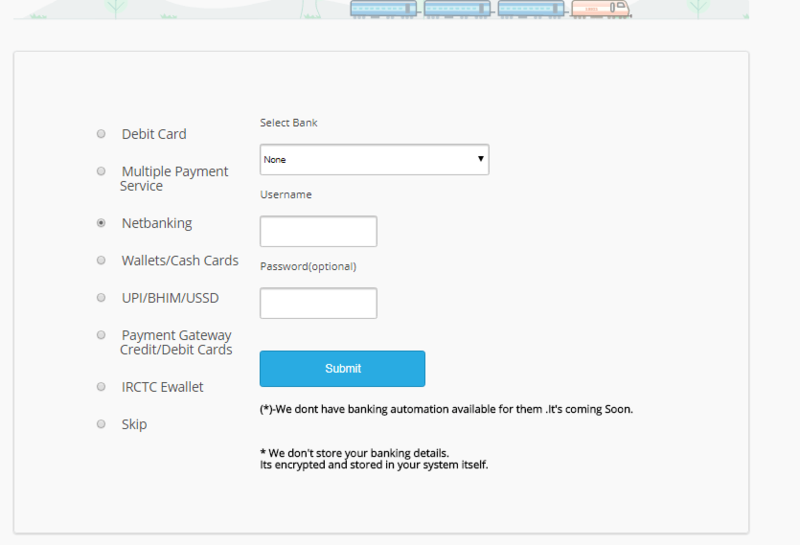 Note: Though the extension is quite popular among IRCTC users, few pointed out glitches in the payment gateway module. Hope the developers are working on it. Click here to know how to sync your system time with IRCTC server time. Try the extension and let us know your feedback in the comments section. 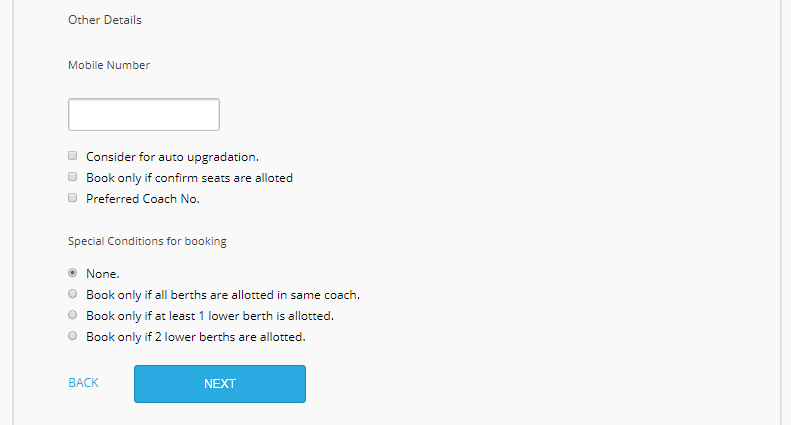 Do you know another extension called Ticket Master for automatic ticket booking in IRCTC? Thanks Mohd for letting us know about the broken link. For some reason, the extension has been removed from the Chrome webstore. I’ll update this page once the issue is fixed. i am not able to get extension now. IF WE OPENED THIS EXTENSION AT 10:57 HRS, WILL IT REFRESH AUTOMATICALLY AT 11:00 HRS ? Why it is not working in mobile?? ?